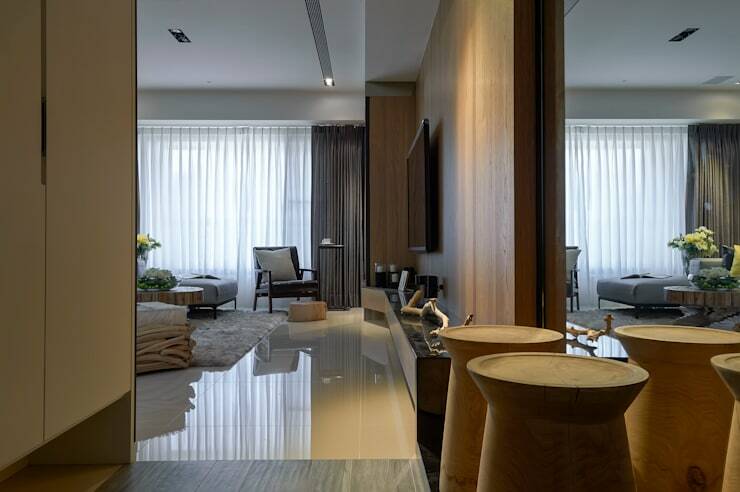 Smooth lines, glossy surfaces and lots of large neutral areas define the classy apartment we will tour today. This is a project that definitely goes to show just how sophisticated an apartment can feel with high quality wall and floor treatments. 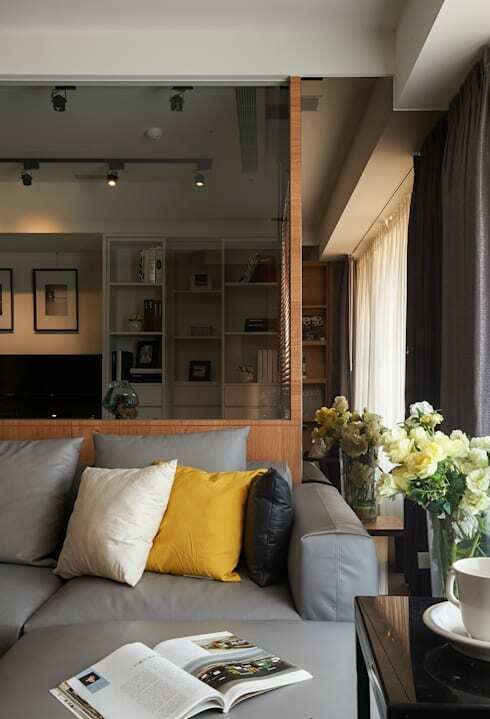 Of course, Taiwanese interior decorators and designers, Yang Di, have also decked out the home with great furniture and dividing walls that are sure to inspire some of our readers. So, if you like the look of a modern home with subdued natural elegance, come with us on our photo tour! The apartment has a polished stone floor, wooden walls and long semi-transparent window dressings. The white curtains allow a diffuse natural light to enter the room that beautifully pools across the reflective floor. 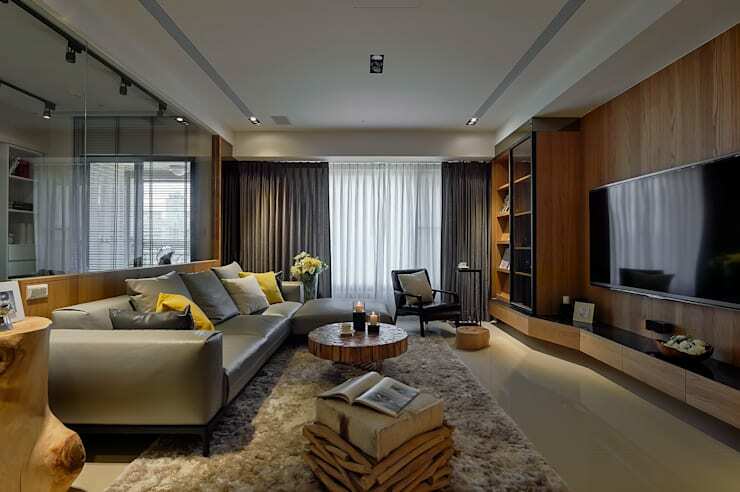 There is not a single bright colour and the living room feels like an incredibly calming natural abode. The earthy colour scheme has a lot of power here. The living room is separated from the kitchen by a long glass wall. This allows lots of light to travel throughout the space and provides a nice contrast to the slightly heavy colour hues in the room. In all, the home feels light and airy, but also comforting at the same time. This is a tricky combination to pull off! Also, we love the low-rise sofa. It adds that extra bit of ease to the design. Big open plan living spaces can easily feel a bit impersonal. But here we have a beautifully cosy dining room that feels quite separate from the other living areas. A big part of its success comes down to the trio of black pendant lights. Also, dining rooms often look good with a hint of formality and here we get that from the black mirror panels on the wall. 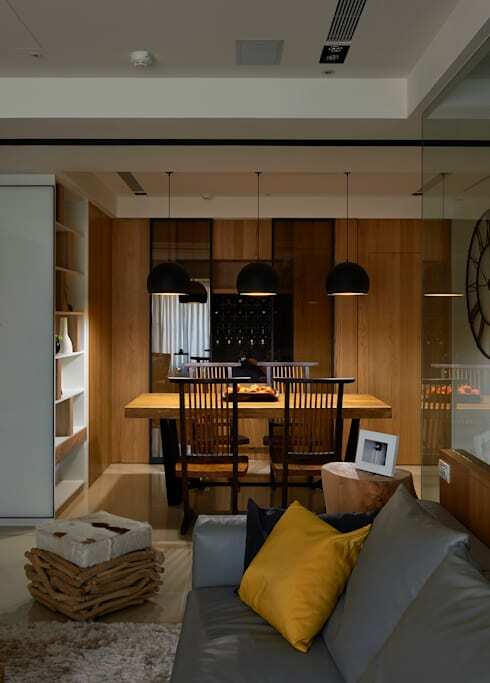 As in most modern home interiors, this one has strong and simple lines of sight. Here we even have that in the raw timber table top. 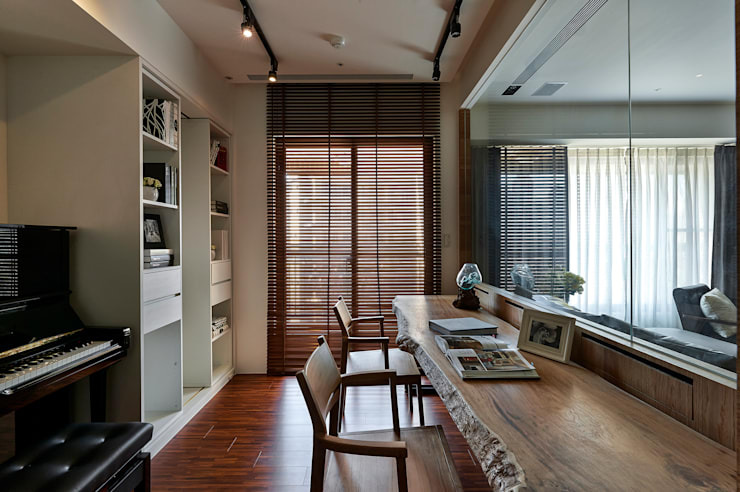 The varying edge of the wooden counter/breakfast bench or desk blends beautifully with the wooden floors and wooden Venetian blinds. The bedroom has a built-in desk instead of a traditional nightstand. 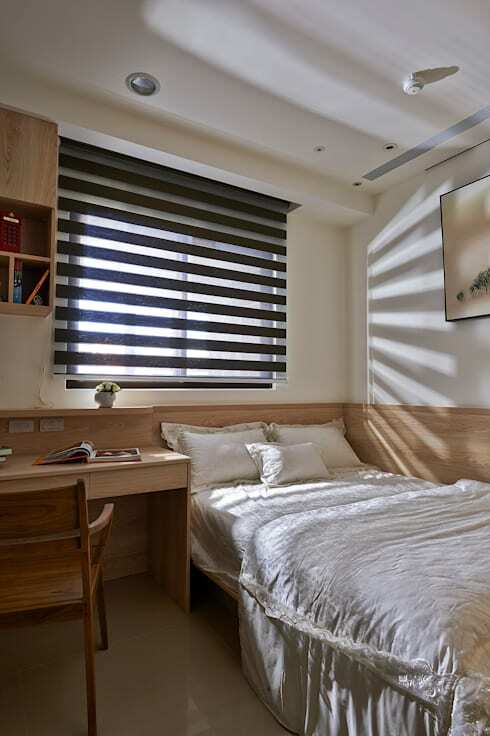 It can be troublesome to put the desk in the bedroom, but we feel it works here because the use of wood adds a calming, neutral feel to the room. It is also well integrated into the overall design because of the wooden panel that runs around the perimeter of the room. Here we have a glimpse of a corner in the living room with a cluster of features. There is a big sofa, a small table and a passageway all set closely together. However, with the aid of a big glass, dividing wall, the small space feels comparatively large. This is a home that almost has the feel of an up-market hotel suite. Black is usually sparingly used in most home interiors, but it can be fantastic for adding an extra bit of drama to the home. 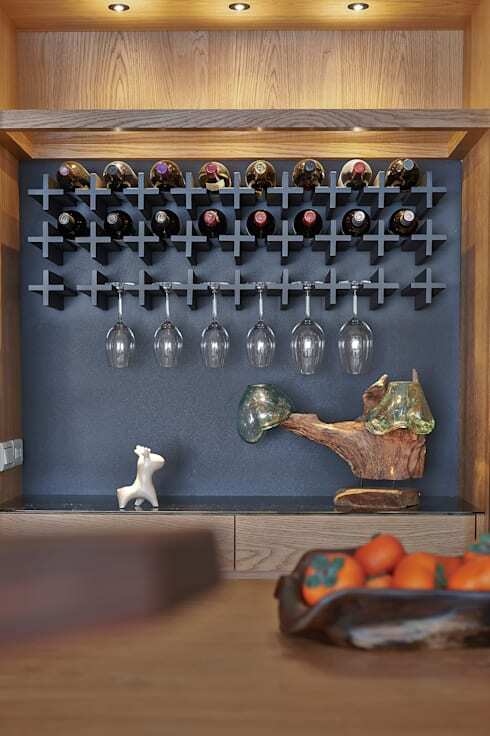 Here we have a small home bar with a wine rack built into the wall. It is a tiny little detail in the home, but one that shows just how fabulous a home interior can feel with attention to detail. If you like this house, you'll love A perfect contemporary flat you'll want to copy.